Baboons live mostly in the African woodland savanna, and highland grasslands. They never wander far from trees, or a source of water. The chacma baboon is found in the countries of Angola, Botswana, Mozambique, Namibia, South Africa, Zambia, and Zimbabwe. (40-60 cm). It has beady, close-set eyes under a heavy brow, and a dog-like muzzle with sharp tusk-like upper canine teeth. Its muzzle is bare, as is its rump under the tail. They are very hairy animals with olive-gray fur. Its fur sticks up all over its body. They walk on all four feet with their tails held in a crooked arch over their back. Their tails are around 2 feet long. Unlike what you would expect, baboons do not live in trees. They spend most of their time on the ground. The only time they go into trees is to escape predators, get food, or spend the night. They might also spend the night on tall rocky outcroppings. Baboon babies go up in trees to horse around and play with each other. Baboons mostly eat fruit from trees, roots, an assortment of plants, and of course, bugs. Baboons live in groups known as troops. Each troop consists of a dominant male and female, and other adult males and females and offspring. When they travel they have their own specific formation. The dominant male is in the front and the dominant female is behind him. The other males form a circle with the rest of the females and the offspring in the center. Baboons have a very complicated social system which is really just based on becoming and staying dominant. Couples will often stay together to raise an infant and males will even become a foster parent if the mother is killed. Infants will start riding jockey-style when they are about 6 weeks old. By the time they are 4 months old they are climbing trees. They depend on their mother's protection and guidance for about a year. The baboons are unique in that all the members in the troop or family are related in some way. Baboons can live to be 45 years old. The baboon have cheek pouches in which they can store food. They can also rely on others in the group or family for food and water. Everybody helps to find food and water in the family. Baboons can run up to 35-40 miles per hour. They also have very sharp teeth which they use for defense if they get into a scrap with a predator. Their main predator is the leopard, but it avoids large males who will gang up on it and sometimes the leopard gets badly injured. Baboons inadvertently feed other creatures by dropping or leaving food behind when they eat. Other creatures scavenge the leftovers. When a predator catches and kills a baboon, it provides food for that predator and its family and scavengers. 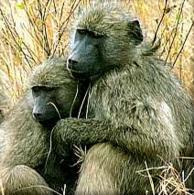 Baboons are duirnal and are always on the move so they don't strip an environment of it vegetation. Like the lion, the baboon is also endangered, and like the lion we need to try and save it. So please do whatever you can to help save these wonderful creatures of the African savanna. Grolier. "Baboon" Groliers 2000 Deluxe. 199 ed.